SILICON VALLEY MESSAGE FOR THE DIGITAL WORLD: YOU ARE F*CKED! - NEVER USE A SILICON VALLEY HARDWARE ITEM! One week ago, President Trump stood up at a meeting of the United Nations Security Council and accused China of attempting to tamper with US elections - mimicking some of the same allegations that had first been levied against Russia nearly two years prior. In his speech, Trump claimed that China was working to undermine Republicans, and even the president himself, warning that "it's not just Russia, it's China and Russia." While the media largely shrugged off this proclamation as more presidential bombast probably inspired by the burgeoning US-China trade beef, the administration continued to insist that it was taking a harder line against Chinese efforts to subvert American companies to aide the Communist Party's sprawling intelligence apparatus. As if to underline Trump's point, the FBI had arrested a Taiwanese national in Chicago the day before Trump's speech, accusing the 27-year-old suspect of trying to help China flip eight defense contractors who could have provided crucial intelligence on sensitive defense-related technology. But in a game-changing report published Thursday morning, Bloomberg Businessweek exposed a sprawling multi-year investigation into China's infiltration of US corporate and defense infrastructure. Most notably, it confirmed that, in addition to efforts designed to sway US elections, China's intelligence community orchestrated a pervasive infiltration of servers used to power everything from MRI machines to the drones used by the CIA and army. They accomplished this using a tiny microchip no bigger than a grain of rice. BBG published the report just hours before Vice President Mike Pence was expected to "string together a narrative of Chinese aggression" during a speech at the Hudson Institute in Washington. According to excerpts leaked to the New York Times, his speech was expected to focus on examples of China's "aggressive moves against American warships, of predatory behavior against their neighbors, and of a sophisticated influence campaign to tilt the midterms and 2020 elections against President Trump". His speech is also expected to focus on how China leverages debt and its capital markets to force foreign governments to submit to its will (something that has happened in Bangladesh and the Czech Republic. The story begins with a Silicon Valley startup called Elemental. Founded in 2006 by three engineers who brilliantly anticipated that broadcasters would soon be searching for a way to adapt their programming for streaming over the Internet, and on mobile devices like smartphones, Elemental went about building a "dream team" of coders who designed software to adapt the super-fast graphics chips being designed for video gaming to stream video instead. The company then loaded this software on to special, custom-built servers emblazoned with its logo. These servers then sold for as much as $100,000 a pop - a markup of roughly 70%. In 2009, the company received its first contract with US defense and intelligence contractors, and even received an investment from a CIA-backed venture fund. Like many other companies, Elementals' servers utilized motherboards built by Supermicro, which dominates the market for motherboards used in special-purpose computers. It was here, at Supermicro, where the government believes - according to Bloomberg's sources - that the infiltration began. Before it came to dominate the global market for computer motherboards, Supermicro had humble beginnings. A Taiwanese engineer and his wife founded the company in 1993, at a time when Silicon Valley was embracing outsourcing. It attracted clients early on with the promise of infinite customization, employing a massive team of engineers to make sure it could accommodate its clients' every need. Customers also appreciated that, while Supermicro's motherboards were assembled in China or Taiwan, its engineers were based in Silicon Valley. But the company's workforce featured one characteristic that made it uniquely attractive to China: A sizable portion of its engineers were native Mandarin speakers. One of Bloomberg's sources said the government is still investigating whether spies were embedded within Supermicro or other US companies). But however it was done, these tiny microchips somehow found their way into Supermicro's products. Bloomberg provided a step-by-step guide detailing how it believes that happened. In espionage circles, infiltrating computer hardware - especially to the degree that the Chinese did - is extremely difficult to pull off. And doing it at the nation-state level would be akin to "a unicorn jumping over a rainbow," as one of BBG's anonymous sources put it. But China's dominance of the market for PCs and mobile phones allows it a massive advantage. One country in particular has an advantage executing this kind of attack: China, which by some estimates makes 75 percent of the world’s mobile phones and 90 percent of its PCs. Still, to actually accomplish a seeding attack would mean developing a deep understanding of a product’s design, manipulating components at the factory, and ensuring that the doctored devices made it through the global logistics chain to the desired location - a feat akin to throwing a stick in the Yangtze River upstream from Shanghai and ensuring that it washes ashore in Seattle. "Having a well-done, nation-state-level hardware implant surface would be like witnessing a unicorn jumping over a rainbow," says Joe Grand, a hardware hacker and the founder of Grand Idea Studio Inc. "Hardware is just so far off the radar, it’s almost treated like black magic." In emailed statements, Amazon (which announced its acquisition of Elemental in September 2015), Apple, and Supermicro disputed summaries of Bloomberg Businessweek’s reporting. "It’s untrue that AWS knew about a supply chain compromise, an issue with malicious chips, or hardware modifications when acquiring Elemental," Amazon wrote. "On this we can be very clear: Apple has never found malicious chips, 'hardware manipulations’ or vulnerabilities purposely planted in any server," Apple wrote. "We remain unaware of any such investigation," wrote a spokesman for Supermicro, Perry Hayes. The Chinese government didn’t directly address questions about manipulation of Supermicro servers, issuing a statement that read, in part, "Supply chain safety in cyberspace is an issue of common concern, and China is also a victim." The FBI and the Office of the Director of National Intelligence, representing the CIA and NSA, declined to comment. Bloomberg based its story on interviews with 17 anonymous sources, including 6 former government intelligence officials. One official told BBG that China's long-term goal was "long-term access" to sensitive government secrets. The companies’ denials are countered by six current and former senior national security officials, who - in conversations that began during the Obama administration and continued under the Trump administration - detailed the discovery of the chips and the government’s investigation. One of those officials and two people inside AWS provided extensive information on how the attack played out at Elemental and Amazon; the official and one of the insiders also described Amazon’s cooperation with the government investigation. In addition to the three Apple insiders, four of the six U.S. officials confirmed that Apple was a victim. In all, 17 people confirmed the manipulation of Supermicro’s hardware and other elements of the attacks. The sources were granted anonymity because of the sensitive, and in some cases classified, nature of the information. Notably, this revelation provides even more support to the Trump administration's insistence that the trade war with China was based on national security concerns. The hope is that more US companies will shift production of sensitive components back to the US. With more than 900 customers in 100 countries by 2015, Supermicro offered inroads to a bountiful collection of sensitive targets. "Think of Supermicro as the Microsoft of the hardware world," says a former U.S. intelligence official who’s studied Supermicro and its business model. "Attacking Supermicro motherboards is like attacking Windows. It’s like attacking the whole world." 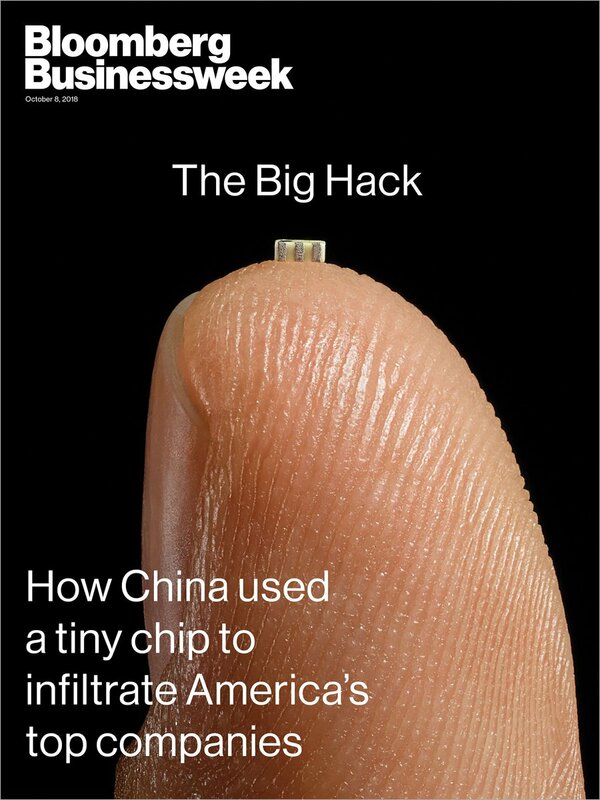 The inconspicuous-looking chips were disguised to look like regular components but they helped China open doors that "other hackers could go through" meaning China could potentially manipulate the systems being infiltrated (as a reminder, these chips were found in servers used in the US drone program). But regardless of what is said on Thursday, one thing probably won't change: Expect to hear a lot less about Russia, and a lot more about China as the deep state's interference myopic focus on the former shifts to the latter. As Kevin Warsh framed the question during a Thursday interview with CNBC where he asked "are we at the beginning of a 20-year Cold War?" in response to a question about curbing China's influence - both economically and defensively. We imagine we'll be hearing a lot more about the breach from senior US officials, including both the vice president and the president himself, in the very near future.